"Investor sentiment is bearish this month, with survey respondents eyeing the risks from a possible trade war," said Michael Hartnett, BAML's chief investment strategist. "Equity allocation has fallen notably while growth and profit expectations have slumped." The bank's latest survey found that a trade war remained the biggest tail risk cited by respondents at 60 per cent, followed by a Federal Reserve or European Central Bank hawkish policy mistake at 19 per cent and a euro or emerging market debt crisis at 6 per cent. Expectations for faster global growth are now at the lowest level since February 2016, BAML said. 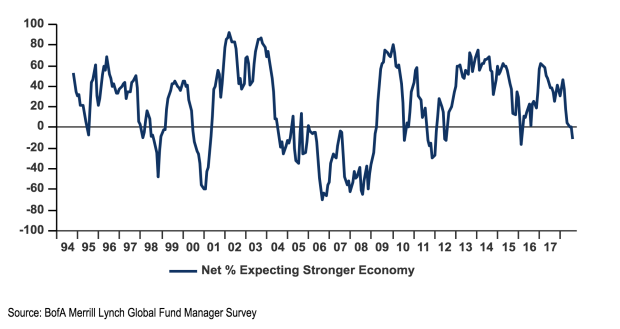 When asked their expectations for global profits, a net 9 per cent of respondents indicated they do not expect an improvement in the next 12 months, down 53 percentage points from the beginning of the year and the lowest level since February 2016, the survey found. That signals, according to BAML, potential underperformance ahead for both cyclicals and defensives. In addition, a net 11 per cent of those surveyed do not think corporate earnings will improve by 10 per cent or more over the next year, a significant downward swing from a net 35 per cent thinking they would in February 2018. Long-term bets on the biggest US and Chinese technology companies - Faceback, Amazon, Apple, Netflix and Google parent Alphabet along with Baidu, Alibaba and Tencent - remained the "most crowded" trade, at 53 per cent, as identified by investors for the sixth straight month and the most crowded trade outright since long bets on the US dollar in January 2017. Betting on a drop in emerging market stocks at 12 per cent and bets on a higher oil price at 10 per cent were the next two most crowded trades in July. It appears that investor optimism for the tech sector was as strong as ever. 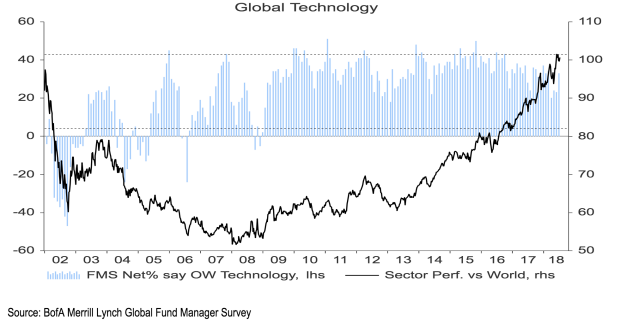 The allocation of funds to tech rebounded 10 percentage points to a net 33 per cent overweight in July, making it the most favoured sector. 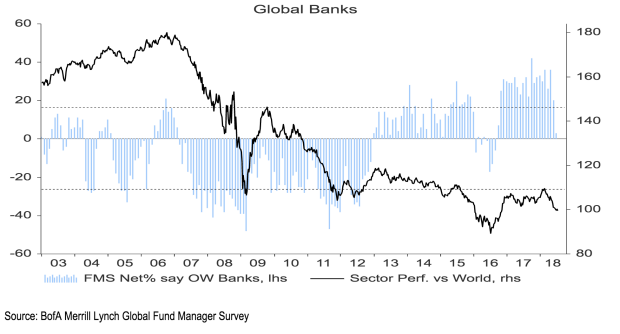 In contrast, bank stocks almost fell off the radar, with the allocation to them collapsing 17 percentage points to a net 3 per cent overweight; the allocation to banks now has tumbled 33 percentage points over the last two months. Investors however have retained their enthusiasm for commodities, with that allocation holding near last month's eight-year higher at a net 6 per cent overweight. Still, a net 25 per cent of respondents said they saw oil as "overvalued", up 7 percentage points from June and the highest level since April 2012 when US oil averaged $US103 a barrel. A record net 17 per cent of managers think that gold is "undervalued", which BAML said represents "an attractive entry point for 'peak profits, peak policy stimulus' contrarian bears". In New York on Tuesday morning, US oil was trading flat at $US68.04 a barrel; that's down from a $US70-plus range in the final days of June through the first two weeks of July. Average cash balances slipped 0.1 per cent to 4.7 per cent this month, keeping the survey's cash rule in "buy" territory level for past six months. Fund managers increased their US equities holdings to 9 per cent overweight, the highest since February 2017; in contrast, US equities were net underweight 23 per cent in September 2017, the bank said.